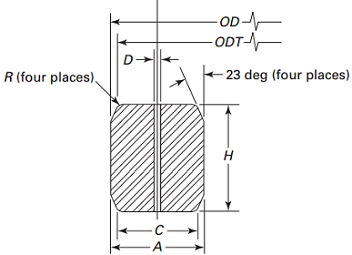 (b) Radius, R, shall be 8% to 12% of the gasket height, H.
Variation in width throughout the entire circumference of any ring shall not exceed 0.10 within these tolerances. Variation in height throughout the entire circumference of any ring shall not exceed 0.10 within these tolerances. 23 deg p angle, ±0 deg 15 min.